Some criticize Reformed Theology because of its supposed suppression of human freedom. And on occasion, some Reformed thinkers do give that impression. Yet the evidence of reformation era writings tells a different story. The Reformers believed in genuine freedom of choice. Yet like their forebears, freedom for them meant that one can freely do according to nature and according to potency. A human cannot fly (nature). And sometimes one person coerces another person to act (since this person has no potency to resist). While the Reformed tradition has diverse expressions on this matter, the neat modern categories of libertarianism, determinism, and compatibilism all mis-describe early modern Reformed thought according to Richard Muller. For many early modern theologians, God’s divine will and human choice worked concurrently together. 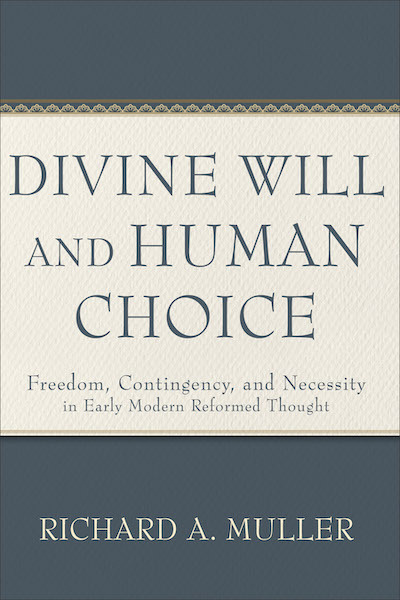 And it is this thesis that Muller persuasively argues in Divine Will and Human Choice. “I hope to shed light on the concept of synchronic contingency as well as question somewhat its revolutionary character, to illuminate the relationship of the early modern Reformed to the older tradition, and to describe the nature of Reformed thought on freedom as something other than what moderns reference under the terms ‘compatibilism’ and ‘libertarianism.’ I also hope to demonstrate the resolution of the debate over the Reformed position and over synchronic contingency can only occur when the logical argumentation concerning freedom, contingency, and necessity is placed in its proper theological and philosophical context, namely, Reformed understandings of the divine decree and providential concurrence, a fundamental point not registered in the debate between Vos and Helm” (13). What readers can expect from the book is “analyzing what the sources say” (12). Muller uncovers “what Reformed theologians have claimed” (12). In other words, he is not making a theological argument per se. He, instead, retrieves and clarifies what Reformed orthodoxy has said on these foundational issues of divine will and human freedom. Buy in Canada or USA. One conclusion Muller retrieves from the past is that modern Reformed proponents affirmed “human free choice as defined by intellective deliberation and multiple volitional potencies and as embodying genuine alternatively in a manner that does not comport with the assumptions of modern compatibilist theology and philosophy” (311). Put simply, Reformed thought affirmed human freedom of choice. Yet this freedom concurs with God’s will. The term used here is synchronic contingency (313). And it is through “concurrent divine willing” that both God’s will and human freedom can occur (314–315). Within this framework, “two rational beings” are “involved in the actualization of one effect” (314). While mystery remains, patterns of Reformed thinking see both God and humans freely willing together (concurrently). And this particular philosophical explanation of revelation (and nature) helps to clarify the foundational question of how the divine will and human choice fit together. Muller has excellently retrieved the Reformed pattern of thinking on this topic. His citations of the literature are broad and persuasive. For the very reason that he cites and comments on many Reformed thinkers, it will be hard to gainsay the historical argument that he makes. Now, whether or not the Reformed pattern of thinking on divine will and free choice is right. That’s another question. Read Muller’s work. But be prepared for a dense, historical study that gives no easy answers but a depth of understanding. Disclaimer: Baker Academic provided me with a review copy of this work without any obligation to give it a positive review.